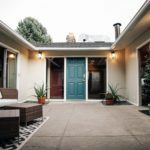 Excited to introduce this unique mid-mod gem tucked back in a quiet, unassuming neighborhood in Cottonwood Heights. You’ll be hard pressed to find a more efficiently designed single level layout. Sitting just under 1,700 sq. ft. this 3 bedrooms, 3 1/2 bath home provides the perfect median between privacy and local convenience. Natural light shines throughout the home’s beautifully open layout, illuminating everything from the entranceway to the bedrooms. Each of the 3 bedrooms is essentially a master suite, being accompanied by their own parallel and private bathroom, in addition to the half bath for guests. Two of the three bedrooms have direct access to the backyard, providing various unobstructed & effortless passageways to the back deck, ideal when hosting get-togethers outdoors. There is also the possibility to add a second laundry to the master bedroom, if one desired. The kitchen has been fully updated with white shaker and quartz cabinets, beautifully complimenting one another. With almost a quarter acre, this corner lot occupies a copious amount of yard space surrounded by a natural hedge fence, accompanied by manicured trees and bushes.